One great thing about the Foreign Service is that we’re meeting people from all over the world. Last week, a woman with whom I worked in Tashkent was in town visiting and she invited us over to her friend’s house for plov. 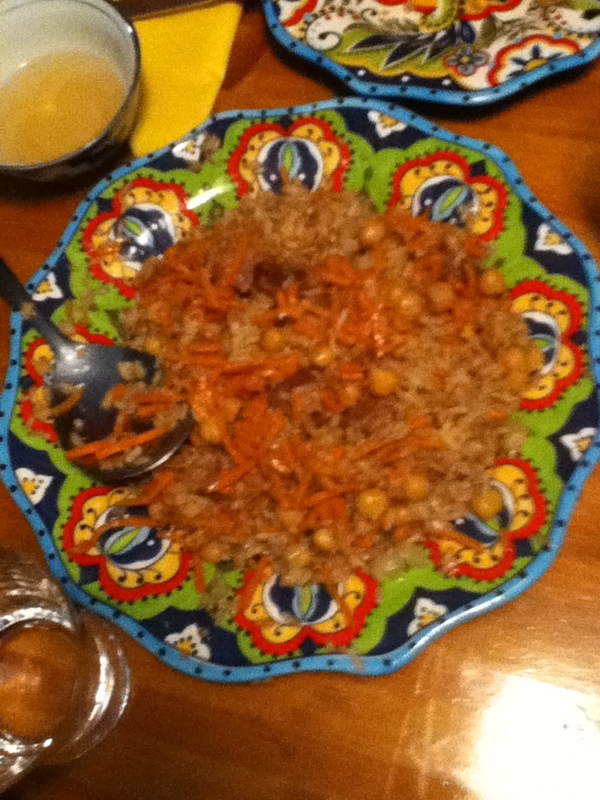 Plov is the national dish of Uzbekistan and it is similar to a rice pilaf. Rice is the base ingredient, along with bite-sized pieces of meat (usually mutton), carrots, and lots of oil. Variations include additional ingredients, such as chickpeas, but few changes are made to the basic dish no matter where it is served. It is often served with a salad of thinly sliced tomatoes, onions, and cucumbers. We drove into DC with Scarlett in tow — earlier that afternoon, she’d had her first experience with an American veterinarian and it involved the overdue removal of stitches and a number of shots, so we were reluctant to leave her home alone. We brought her something to sleep on, in hopes that she would be tired after her trip to the vet, but other than a few minutes when we were eating, she was too busy getting attention from everyone to bother with sleeping. She even got to try some plov! The plov itself was delicious and I ate enough of it to keep me full for a very long time… until dessert. There was cheesecake and, although I requested half a piece, I was served two halves (different flavors), thus defeating the purpose of having half of a piece… of course I ate all of it. One must be polite, after all. When we first walked into our host’s house, I admired the white picket fence outside and the newly renovated interior (we’ve been watching a lot of HGTV, can you tell?) but what struck me most was the presence of many things from Uzbekistan. This shouldn’t have been surprising, of course, but my two worlds were suddenly colliding on a number of levels. Uzbekistan feels like a world away: add in some of the food, decor, language, and a few of the people, and I almost forgot I was in DC instead of someone’s home in Tashkent. Up until that point, I hadn’t encountered much from my daily life in Uzbekistan; all of a sudden, here were paintings of familiar sites, the ubiquitous blue and white tea set (we have one, too), and someone I saw at work every day. It was really nice to have many of these things around me again, and I had forgotten how beautiful it is. In Uzbekistan, there is a plethora of handmade crafts like silk, embroidery, and pottery. I think we managed to get some of everything but most of it is packed away with our HHE, so it’s been a while since I’ve been around any of it. What can I say, other than it’s hard to say no to pretty things!